My first impression from watching 30 seconds of an episode: EXTREMELY weird. My friend's first impression: "this show is on crack." But somehow, I still got sucked into the show. I still think it's extremely weird, but it works! It's produced by Titmouse, so of course the flow of animation is beautiful. Their slang is different than the norm (as already seen in the opening), but like the humor and oddities that come with it, it really does work. Something I'd like to point out is how the Ninja wears a scarf. A SCARF. I seriously LOVE that scarf! I wouldn't mind having my own (a ninja-version, that is. I have plenty of regular scarves). Not only does it look cool flying all over the place, but the Ninja uses it as a weapon! And yes, it proves to be quite useful. -Animation: absolutely beautiful. Everything is so colorful, too! -Music: fitting. There's nothing I don't like about it. -Characters: extremely weird, but I love 'em all! Even the background characters. And the Ninja Nomicon...which is basically a book...that doesn't speak...but it's a book with personality! 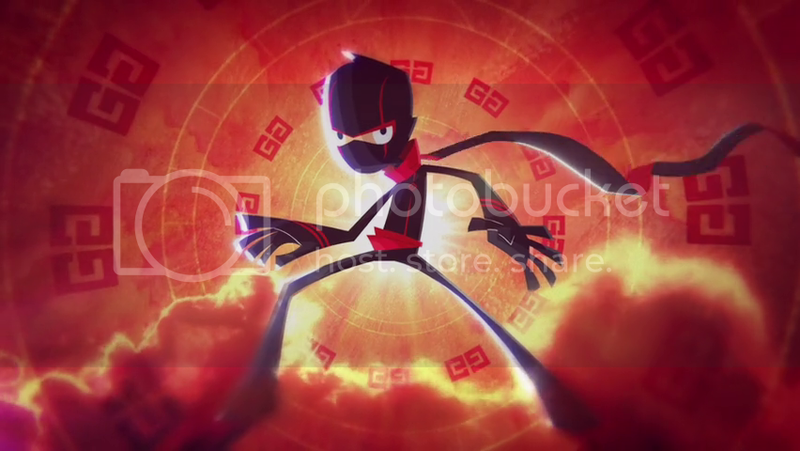 -Storyline: Seriously, who doesn't love a story involving a ninja? But I guess to expand on it (if you don't feel like watching the video), a high school is built on top of a prison for the evil Sorcerer, where the Ninja (who is chosen every four years to don the magical Ninja mask: freshman->senior year) must ensure that he stays in his prison. They've got the green light for a Season 2, so I'm pretty excited about that! But they still need the air some of Season 1 episodes...actually, a lot more. But since it's on Disney XD, of course the airings are off...I just hope it doesn't get killed of BECAUSE of that, just like Motorcity was (another amazing Titmouse production). Also, I believe today is exactly the anniversary day of when the show premiered, so celebration!!! I absolutely love the latest episode, McFear Factor! It cracks me up how Randy is scared of chickens, and not just simply scared of them, but because he knows [B]freaky facts[/B] about them. And if you've heard of Amanda, what do you think? Some say she's going to be the Sorcerer's lover, but I don't buy it. It seems a bit weird. I think of her more as a minion. I'll only accept her as his lover if it actually appears as a canon. Seen this show a bit here and there, wasn't to bad from what I saw. I tried watching a few episodes and my impression was the same as you friend's: this show is on crack. Recently, I've been thinking about giving it another try because I didn't think the show was "bad" but it was way too hyper for my tastes. Haha. Actually, I did think that it was too much at first, but eventually, I got use to it. Plus I like ninjas, so of course I picked up this show pretty quickly soon enough. I think the show does get better since they're starting to focus more on the upcoming final battle, so the latest episodes have definitely been some of my favorites. I also find it funny how many fans' headcanons became...well...canon. Last episode for example (I don't think this is spoilers since it's in the video description, so excluding tags): Howard becoming the ninja for a day. I loved his version of the opening. It was very much like Texas' version of the Motorcity opening, except Texas had passion about his song whereas Howard was quite lackadaisical about singing. Also, I enjoy seeing the scenes where it explains or shows why Randy was chosen to be the ninja. At first, I thought it was a random pick cause Randy can sometimes be a bit...eccentric...but throughout the show, you see he acts very noble and brave (and occasionally responsible). Plus, everyone else is probably even more so crazier than him to be allowed to be the ninja. RIP Motorcity. I eagerly await the day that it would miraculously come back on television. x'D Wow so you was to bruce on the replay button. I never can seem to catch them. I've been missing RC9GN airing on television, but I've been buying some of the episodes of itunes to make up for the -1 view count. Although the new episodes are starting the air again the day after (Sunday) at 8pm, so that's pretty nice. Oh yeah...Tron...another great show taken down. Disney XD, whyyyyyyyy?! Lol. This forum is beginning to be a cancelled shows grave forum. I just hope RC9GN doesn't join it anytime soon. Yeaaaah, I usually don't buy shows on itunes but seeing how Tron: Uprising and Motorcity were booted out, I decided to show my support by buying RC9GN episodes! I think Disney needs to move some of it's XD shows to the main channel, cause not a lot of people have XD in the first place, so they miss out on the good shows. lol Can understand that. I just can't afford to do the same. I think they need to get rid of most of them all together. The only ones I know of that are actually watched a lot are Phineas and Ferb and Gravity Falls. Totally know what you mean. I should be limiting how much I buy, as well XD But every time I see a darn episode, I get all excited and want to buy it. Lol. Although I've bought 4 so far, I think that's a good limitation...although now that we're nearing the season finale and getting to all the good and juicy stuff, I might shpill and end up buying all the later episodes. So basically, the keep the cartoons. Lol. I totally agree! All the live-action shows are just...meh. And pretty redundant. I do like Kickin' It, although that's on XD as well (and the newest episodes are becoming a bit farfetched from an average karate dojo). I've actually never seen Gravity Falls cause it looked a bit whack (well, just a bit moreso than RC9GN). Recommend? xD I know that feel, you can't help but guy. *o* I'd like to see those gifs! I was wrong. It wasn't a gif, but multiple images XD But here it is! Just realized the last image says, "Hey! I'm not that dumb!" Hahaha. When Howard's the actual ninja or just pretending to be? Cause there are two different episodes on those two things XD How'd you like it??? lmao that last image does say it! x'D Guess the book has all the past ninjas in it. It was the one where he's the actual ninja. Yup! According the the ninja Howard episode, all past ninjas knowledge/minds get transferred into the Nomicon, so there's 200 past ninjas arguing with one another XD I find that hilarious! Usually, hive minds all think alike, but nope. All the ninjas like to bag on each other or oneself. x'D lmao That'd be a punishment to me rather than a reward. Just imagine being stuck in a book for 200 years with people that you can't get along with. The new episode brought Macantfee back!? That is the karate guy from the one episode right?